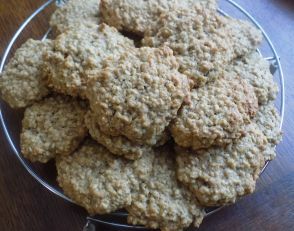 Banana Oat Cookies – Create, Make & Bake! 23rd June 2017 19th October 2017 - by Abbie - 6 Comments. Yes, more cookies. These are similar to the Apple Oat Cookies, but I think these are easier. 1. Put the banana’s, both sugars, egg, butter and vanilla in a bowl a mix well. My mixture looked very lumpy, some of it being butter, but mine still worked well. Preheat oven the 350*F/180*C/Gas mark 4, line a baking tray with baking paper . 2. Mix in the rest of the ingredients, adding the oats after everything’s been mixed together. Roll a table spoon of the mixture and place it on the sheet, flatten it slightly onto the tray into a thick disc. Bake for 10-12 minutes. Enjoy.! Yum! Need to make this at home! This looks yummy, I need to try to make them this weekend! These look so yum! Love the combo! These really good and tasty, I think I need to try this.